Mandas Disney Blog: WDW during the holidays! Welcome to those of you joining me from The Disney Chick and those of you just hopping aboard! I am the 2nd stop on our Magical Blogorail! Top of my list would be The Osborne Family Spectacle of Dancing Lights in Disney's Hollywood Studios! When I visited WDW in October last year I managed to see the beginnings of the lights being put up ... even in daylight and with nothing turned on, the sheer number of lights blew me away ... and they weren't even finished putting them all up yet! I'd love to see them all in their lit up glory! My next option seems obvious ... but I'd love love love to go to Mickey's Very Merry Christmas Party! To see Cinderella Castle all lit up would be amazing! 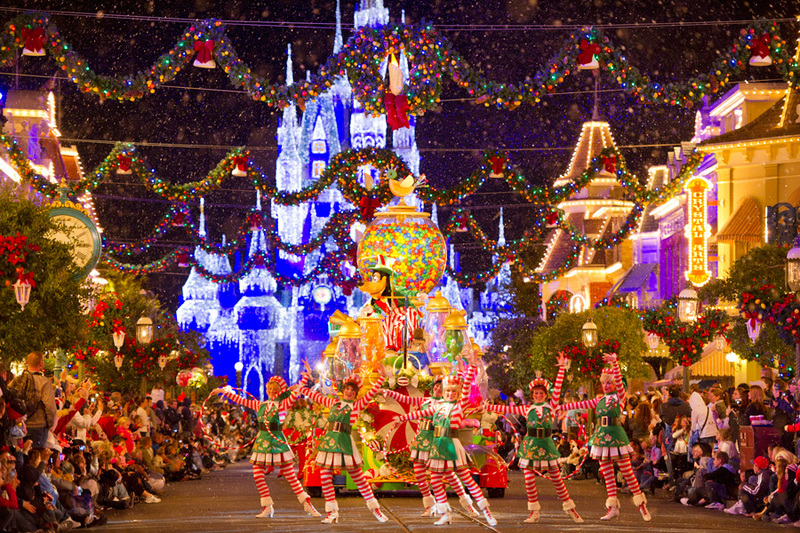 And to see Mickey's Once Upon A Christmastime Parade would be a dream come true! I've seen it so many times on tv as a child and would be thrilled to see it in real life one day! Especially Santa Claus himself! Finally, I'd love to hop on the monorail and take a tour of as many Disney Christmas Trees as I can! Including the one in the Grand Floridian, as well as Wilderness Lodge and the Animal Kingdom Lodge! They all look absolutely breathtaking! These are all things that I hope to experience one day also - hopefully next December! It really is a magical place to be at Holiday time!! We just came back and Osbourne Lights are always my favorite part of a holiday trip! Hope you make it there someday!! The pics just do not do it justice! !